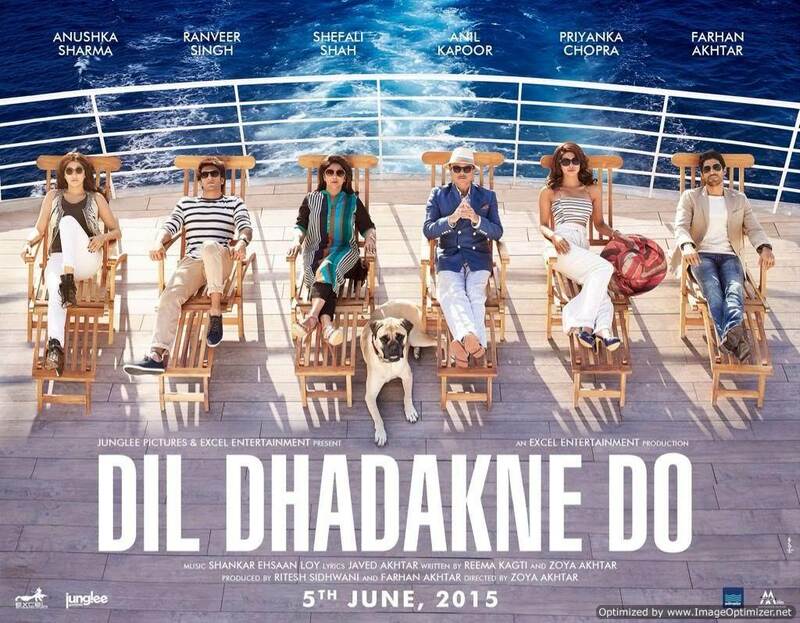 Read review for this film "Dil Dhadakne Do Movie Review"
Kamal Mehra ( Anil Kapoor), a businessman owns Ayka, a company which is leading towards bankruptcy. He is in a problematic relationship with Neelam ( Shefali Shah), his wife; Ayesha ( Priyanka Chopra), his daughter and his son Kabir ( Ranveer Singh). Ayesha runs her own travel business. She is not happy with her husband Manav ( Rahul Bose), an egoistic person who dislike Ayesha’s family. Her brother Kabir dreams to be a pilot, but has to unwillingly involve into family business. Kamal invites his family members and friends on a 10 day journey around the Mediterranean on his 30th marriage anniversary with Neelam. One of their guests is a family member of Mr. Sood ( Parmeet Sethi). Kamal plans to get his son married to Noorie (Ridhima Sood), Sood’s daughter and at the same time make him invest in Ayka. On ship, Kabir meets Farah ( Anushka Sharma), a dancer, and gets involved in a relationship with her, while Noorie falls into loving Rana ( Vikrant Massey), who belongs to a family that her parents dislike. Noorie and Kabir decide to keep their parents unaware of their respective relations. Ayesha thinks of divorcing Manav, whereas her parents are against her decision. Sunny ( Farhan Akhtar), son of one of Kamal’s staff gets into the ship. He dated with Ayesha when they were teenagers. At that time, Kamal paid for his overseas studies to as to separate him from his daughter. He is now a journalist and Ayesha still has affection for him. He too appreciates her. Once, while Kamal was flirting with a female guest, Neelam sees him and starts wondering about her indecision to divorce him in the past. Meanwhile, Farah finds that Kabir will be marrying Noorie and breaks up with Kabir because of anger. Kamal finds Noorie involved with Rana and he suspects to have suffered a mild heart attack. It was later found as stomach gas while boarding to the hospital. In hospital, Kamal informs Kabir, about Noorie’s involvement with Rana and signals him to stay away from her. Filled with anger, Kabir tells his family about his love with Farah and says that he had the knowledge of Noorie’s relations since long. He also reveals his disliking of getting involved into family business. Later, Kamal tries to solve the issues between Ayesha and Manav. He becomes impatient after observing Manav’s misbehavior. Subsequently, he allows her to divorce him and begs forgiveness. Soon, Ayesha and Sunny reunites. Meanwhile, Kabir confesses his mistake to Farah and asks for her forgiveness. She later gets fired for involving with one of the passengers on the ship and is made to leave the ship. Kabir comes to know this long after the ship has started to sail. With no option left, he jumps from the ship, hoping that his family will rescue him and help him get to the coast. His family members, including their dog named Pluto requests him using a lifeboat. Thus, the movie ends with all of the members of the Mehra family being happy.